While in St. Louis to perform Lilia! at Principia Upper School, I offered to talk to classes about aspects of what I do. To my surprise, the first to take me up on it was a third grade teacher whose class was gearing up to deliver monologues about famous African Americans. My first thought was, “Hmmm… third graders. What can I possibly give them?” I expected to be talking to high school drama classes. The kids sat cross-legged on a rug in their classroom watching me with adorably wide eyes as we chatted. They expressed concern about their first time performing in front of an audience. Their teacher smiled on with compassion. I performed a couple of scenes from Lilia!, then told them how my grandmother was an actress, but that was definitely NOT what I wanted to be. No way! I wanted to be a visual artist – a sculptor or painter. Suddenly, it all came flooding back. I was their age when I first encountered acting. I told them the story. One day, my dad took me to the house of a lady in town who taught acting classes. She made grand gestures and spoke with rounded, elongated vowels. I clung to his hand and said nothing while she spoke to him over my head. I was relieved when we left. “Maybe you’d like to take acting classes from her,” my dad suggested. I shook my head NO, hoping that would be the end of it. In third grade, I was going to a new school called Elisabeth Morrow. One rainy morning there, the drama lady my dad and I’d visited entered my classroom. The drama lady pulled out a red telephone and instructed us to come up to the front of the room one at a time and improvise a telephone conversation with an imagined person on the other end. Here I was, the new kid. The quiet one. Elizabeth. This was my first year using my real name to avoid the teasing I’d received at the old school with my nickname Libby. One by one, the other children went up to the front of the room. Liz went up, and Lizzie – the other two Elizabeths in class (I insisted on the full “Elizabeth”), Peter, Carl and everyone else. I heard nothing anyone said because my heart was pounding too loud. I could hardly believe my ears. I expected classmates’ heads to turn and say, “No, wait!” Peter, the loud-mouthed class clown would surely blow my cover. But no one saw me. No one noticed. The drama lady lifted her red telephone off the desk, placed it in her bag and exited with a grand flourish. A few days later, Miss O’Callahan announced our class would be putting on a play called The Missing Turkey Lurkey. Carl, the chubbiest boy would play the title role. 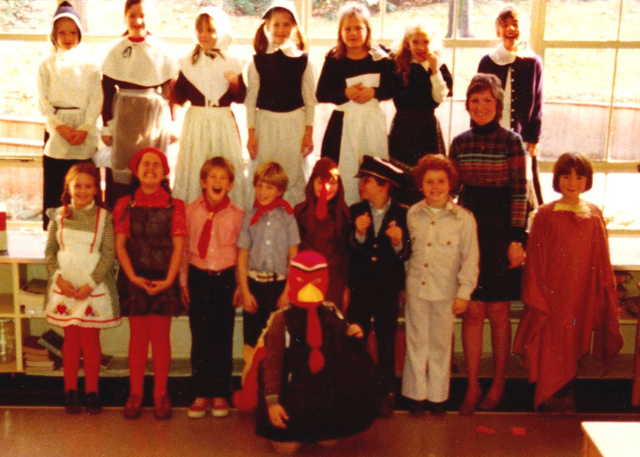 I was cast in the chorus, dressed as a pilgrim. Miss O’Callahan reviewed our lines with us daily. You can tell Thanksgiving’s coming without looking at the clock. There was no way I was going to say the lines like that in unison with the rest of the chorus. I’d sound ridiculous, plus it would ruin everything. I ignored her direction completely. In sixth grade, my dad took me to a local drama school to watch a class. I sat frozen as kids my age got up and improvised. “Would you like to sign up for classes here?” My dad asked afterwards. Then, in seventh grade, I befriended a new girl who moved to town named Charlotte. She was shy, too. We went to see Fantasia together. On the way home, we talked to each other in accents. It was so fun, I forgot to be self-conscious. Well, gosh, if Charlotte was shy and she was OK doing that, maybe it wouldn’t be so bad. Plus, my ten year-old sister was already taking the train into New York four days a week for classes at the School of American Ballet. It would be exciting to have my own reason to go to New York. I told my grandmother I wanted to go to the Neighborhood Playhouse. Delighted, she immediately called and set up an interview. We went together, and I was accepted. A few days before classes began, I called Charlotte. “I’ll see you on the train Saturday morning,” I said. It was too late to back out, so I went alone. None of the kids knew each other the first day, so everyone was shy but ready to jump in, which I did. I loved it and have been hooked ever since. Some of the third graders looked back at me thoughtfully, others smiled. I assured them those feelings of nervousness were really just feelings of excitement. How I would have loved to have been there for their performances to cheer them on! 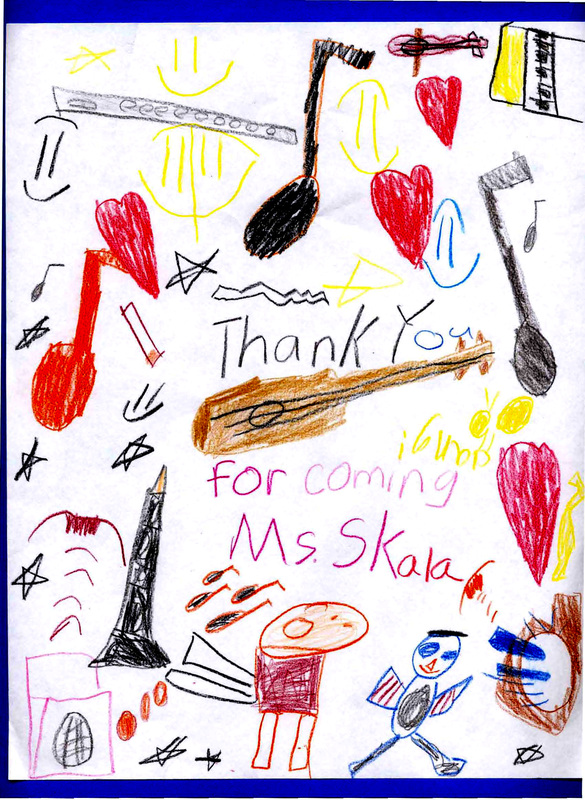 A few days later, I received a package of beautifully handwritten thank you notes from those kids (see below). Here I was hoping I’d managed to give them something of value – a boost of encouragement, and their letters turned out to be enormously encouraging to me, letting me know I had indeed helped them. My heart grew about forty times bigger. I was so inspired by the power of their letters that I immediately wrote the class to express how much they’d meant to me. What a wonderful story! I enjoyed it thoroughly. Some of my students recently visited a fourth grade class — taught by a former student of mine — to read them some stories for National Reading Week. The kids were remarkably polite and attentive. We concluded the session by reading a short play, in which several of the children readily volunteered to participate. We had as good a time as they did.